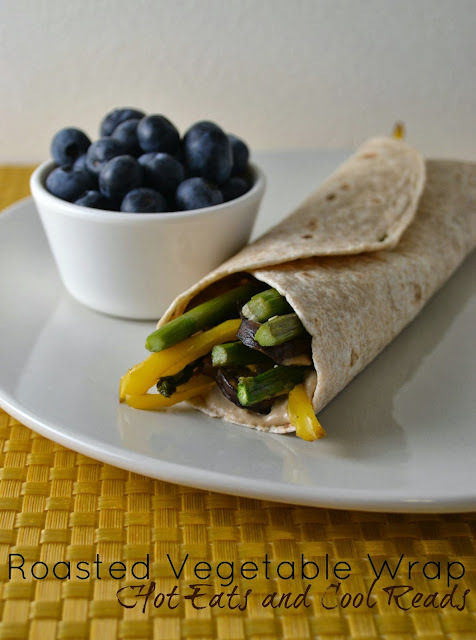 This healthy wrap is a delicious lunch or dinner option! It's savory flavors come from onions, bell peppers, rosemary, balsamic, garlic and hummus! Hello!! I hope your week's been great so far! Today I have a wonderful recipe for you, plus reviews and a giveaway for two great cookbooks! Diabetes hits close to home for me. My Dad has it, as well as several family members. When I was offered the chance to check out these two awesome cookbooks from The American Diabetes Association, I knew I would love browsing through them for some great, new recipe ideas. Healthier eating is a big thing for me this year and both of these cookbooks are great for that! First up is The Diabetes Fast Fix Slow Cooker Cookbook by Nancy S. Hughes. My slow cooker is one thing I don't use enough in the kitchen. This cookbook has 150 recipes that are inexpensive and healthy to make, using lots of fresh ingredients. Tons of inspiration here for diabetics and non diabetics, alike. The recipes that caught my eye were: Pizza Pot Pasta, Fresh Fennel Bean Soup with Parmesan, and dessert of course, Triple Berry Dumpling Style Shortcake. This cookbook also offers nutritional info for each recipe, and also has a recipe index at the beginning of each category for easy searching. The recipes are all within nutritional guidelines for the American Diabetes Association, making it so easy to plan meals. I will be trying a recipe from this book soon, so check back for a future recipe post! Next up is The With or Without Meat Cookbook by Jackie Newgent. This cookbook is my new favorite!! I had the hardest time choosing what I was going to try first, and I finally decided on the Roasted Vegetable Wraps from page 136. The best thing about this cookbook, are the instructions on what meat to add to each recipe if you wish, as well as instructions for preparing. So easy to follow and the recipes are so creative and use tons of fresh ingredients. You will find 125 recipes in this cookbook which also fall within the nutritional guidelines! Gotta love that! I decided to try the Roasted Vegetable Wrap with the addition of asparagus! My sister, Shantel and I both loved these wraps!! The roasted vegetables have such a yummy flavor, and the hummus combined with balsamic is the perfect sauce to go with the veggies. I added asparagus, as I am addicted right now and love them roasted. You can add sautéed chicken breast strips, if you prefer them with some meat. I loved them without! Enjoy!! Other meatless recipes you may enjoy: Rustic Dill Tomato Soup, Cheesy Spinach Rice and Orzo, Creamy Mushroom Rice and Quinoa Soup, Spicy Garlic and Basil Sesame Noodles, Open Face Avocado, Roasted Portobello and Fried Egg Sandwich or Broccoli and Sweet Pepper Pasta! In a large bowl, toss together the baby bellas, bell pepper, asparagus, garlic, onion, olive oil, rosemary, salt and pepper until combined. Arrange in a single layer on a cookie sheet. Roast until vegetables are cooked though, about 20 minutes, stirring halfway through. Remove from oven, set aside to cool to room temp. Mix together the hummus and balsamic in a small bowl until combined. Spread the entire surface of each tortilla with the hummus mixture and sprinkle veggies over top. Tightly roll up, slice in half diagonally and serve! I love the roasted veggie wrap idea. I need to start eating healthier so this is just what I needed. Thank you. You're welcome!! They are so good. Enjoy! G'day Looks very healthy indeed! YUM! It's a great cookbook! I'm loving meatless meals lately! Great giveaway, and yummy recipe too! Thanks! I just became a vegetarian so that book would help me so much! What an awesome giveaway! With hubby being diabetic..and me..borderline...I would make great use of both of these great books. I make meatless dishes two or three times a week. I also use the crockpot quite bit.